The skills needed to create a perfect omelet has eluded me for quite some time. Over the past several years, my travel work schedule has given me the opportunity to observe many skilled omelet makers at work in hotel restaurants. I can now report back the secret ingredient to making a great omelet: lots of oil. While a bit of olive oil is great, I try to avoid it in large doses, especially just for the purpose of a perfect looking omelet. 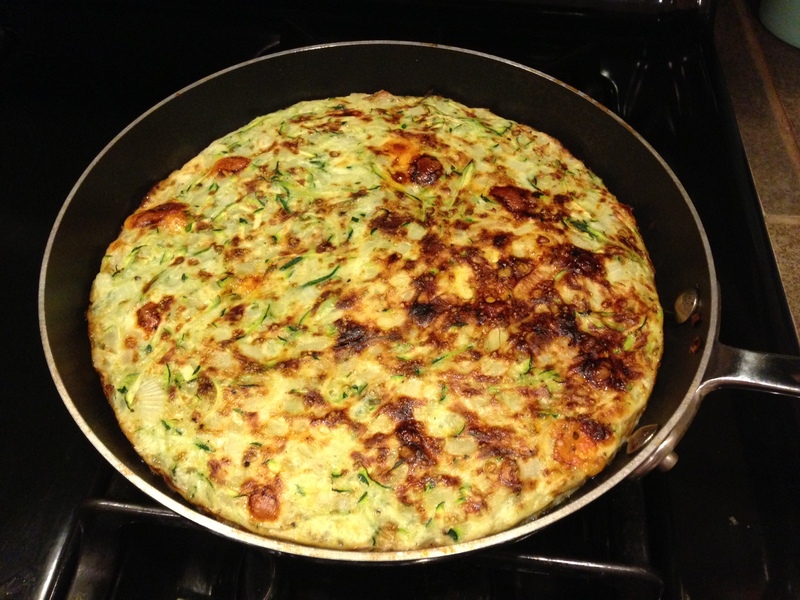 And that is why I love this method for making a frittata: it is quick, easy, and looks beautiful when you’re done! I also strongly recommend experimenting with different veggie fillings, such as asparagus, spinach and mushrooms. 2. Saute the onion in olive oil for about 8 minutes. Add the bell peppers and zucchini.Add the fresh spinach, and put a lid on the sauce pan (the spinach only takes a minute or so to steam and cook down). Put veggies in a separate bowl to cool. 3. Mix together the egg whites, cheese and seasonings in a separate bowl or Pyrex pitcher. Add the vegetables. Poor the mixture back in the frying pan over low-medium heat, making sure the veggies are evenly dispersed. Cook for a couple minutes, or until the edges start to turn brown. Put the frying pan directly in the oven and broil until the top is slightly brown. 4. Slice the frittata into 4 wedges. This recipe yields 4 servings, 150 calories each. This entry was posted in Breakfast and tagged cheese, egg, gluten-free, rosemary, savory, vegetable, veggie. Bookmark the permalink.